The air is getting cooler here in Central Texas and it’s perfect riding weather. In fact, the mornings can be a little cold. Even a mild 72°F can get pretty chilly when the wind is hitting you at 70mph! With that in mind, I put on a long sleeve T over my usual workout shirt before zipping up my jacket and heading out. 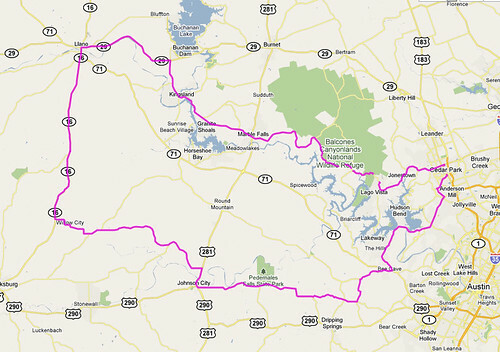 I decided to go south on 620 again then out towards Pedernales Falls. There are some really nice roads out there. I really need to keep my camera on the handlebar mount and ready to take a photo, because I come upon some really nice views, but they are gone in a flash. For instance, riding down Crumley Ranch Road affords some beautiful Hill Country vistas. On Fitzhugh Road I came up on a water crossing which was maybe about 10 feet long, and I thought I slowed down enough but when I went through, the water kicked up with such force that my feet got knocked off the pegs and water flew up everywhere, soaking me and my bike. That shook me up a bit, but then the water on the outside of the jacket started making me cold. I had to turn on the heated grips to high in order to warm up. I have to say that it was pretty fun though! Next I rode towards Willow City, where the Willow City Loop begins. I thought about riding it, but decided to wait until I could go with a friend. The road I took to get there (1323) was great. A decent amount of twisties and no traffic. When I passed the other endpoint of the Willow City Loop, I saw a couple motorcyclists hanging out under the trees. I thought at first that they were a couple of motorcycle police, and I cut throttle as soon as I saw them. When I passed them and waved, I think they were laughing at me. I’m just glad it wasn’t a policeman sitting there giving out “performance certificates”. During this ride I wore some earplugs that my friend Jeremy gave me. They are the simple foam ones from Home Depot, but they work great and are very comfortable. It really makes riding more enjoyable. If you don’t know, riding above 60mph gets very loud not because of the bike, but because of wind noise. It depends on the helmet of course, but earplugs are definitely the way to go. I am a convert. 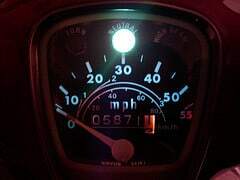 The only downside to them is that you get so comfortable on the bike that it is easier to go way over the speed limit. You just don’t realize you are going so fast. Just gotta get used to it I guess. On the way back I took good ol 1431 which is always fun. Zero traffic and lots of twisties is a dream! I was back before 11am and ready to spend the rest of the weekend relaxing with the family.